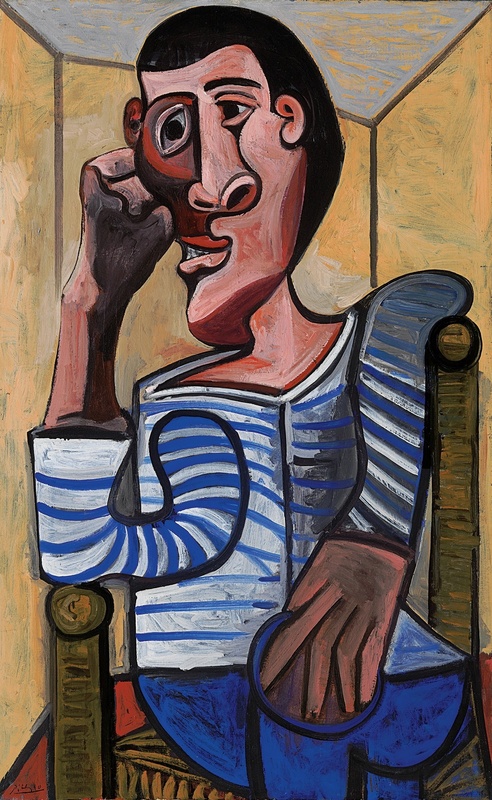 Christie’s has raised the game with its May auctions with its announcement that it is to sell a Pablo Picasso self-portrait, seen as making as much as $70 million. “Le Marin,” an oil-on-canvas work executed on October 28, 1943, has long been seen as among Picasso’s most celebrated self-images, with the artist wearing one of his famous striped fisherman’s jerseys. It will be included in the May 15 Evening Sale of Impressionist and Modern Art in New York. Executed in Paris at the height of Occupation – Picasso and western civilization’s lowest ebb – it is a revealing view into the artist’s wartime psyche. The work was formerly in the collection of Victor and Sally Ganz. While the portrait formally is “price on application,” an estimate puts it in the region of $70 million, one of the five highest prices for the artist at auction. Christie’s contended that alongside the Rockefeller Picasso it is also selling, this is “the most important painting by the artist to appear at auction since ‘Les Femmes D’Alger (Version 0)’.” This sold in May 2015 for $179.4 million including fees, a record price for a painting at auction at that time. It remains the most expensive Picasso in public auction and the second-most expensive painting after the “Salvator Mundi,” attributed to Leonardo da Vinci and sold last year. The Algiers work was one of the versions of “Femmes D’Alger” that had also been in the Ganz Collection previously and sold in 1997. “Le Marin” also last appeared at auction in 1997 after decades hanging in the Ganz drawing room. Victor Ganz bought it for $11,000 in 1952 from the publisher Harry Abrams. At the outbreak of the war the Spanish artist chose to stay in France, despite offers to move to Mexico and the US. As the painter of “Guernica,” he was known as an anti-fascist and denounced by Hitler. German agents regularly visited Picasso’s studio, insulted him and destroyed his paintings. Five weeks before he painted “Le Marin,” the Nazis threatened to deport him to a concentration camp. He was saved by appeals from friends and Paris was liberated in 1944. The May sales include The Collection of and Peggy Rockefeller and Picasso’s Rose Period work, “Fillette à la corbeille fleurie (Young Girl with a Flower Basket)” from 1905, also estimated at about $70 million. The work will be on public exhibition in Hong Kong from March 31 through April 3. The Impressionist and Modern Evening Sale is in New York on May 15. ← La Joconde à Lens : viendra, viendra pas ?